The sales funnel is obsolete. In fact, it has been obsolete for a long time. Bold statement? Yes, but when you look at the facts, it’s obvious. 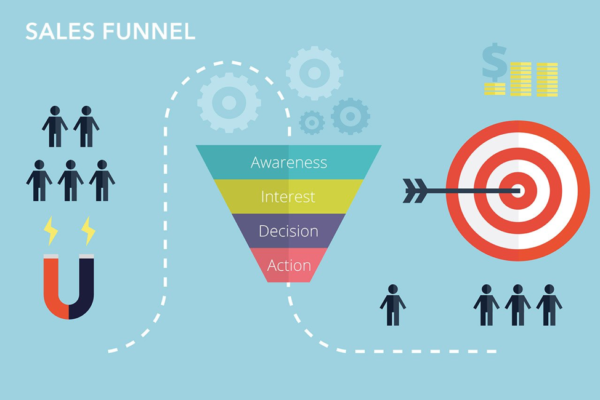 The sales funnel doesn’t help predict anything about buyers: Not their mentality, not their movement through the buyer’s journey, and not when they might make a purchase. Modern buyers are too unpredictable. They have way, WAY more information at their fingertips influencing how they shop and buy. People can’t remember what it was like to not be able to learn, do, or buy things when the need struck by reaching for the device in their pocket. “Well-advised” consumer – Buyers want to make the right decisions, no matter how small, and they’re using their smartphones to get informed. “Right-here” consumer – Buyers expect mobile experiences, including shopping, to tailor to their physical location. “Right-now” consumer – Buyers want purchasing power no matter the time or place. But how do they fit on the old marketing charts? The answer is no longer cut and dried. The sales funnel is too rigid to accommodate the modern buyer’s journey, and too cold to represent the nurturing stance of content marketing. That’s why we need a more fluid, holistic model. Before I get into the marketing lifecycle concept and why it works, let’s go back in history. The concept of marketing stages originated with the AIDA model – awareness, interest, desire, action – developed by E. St. Elmo Lewis in 1898. 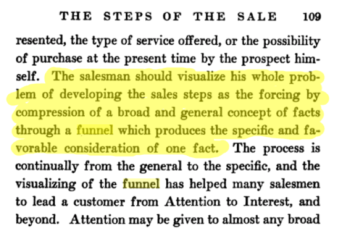 The salesman should visualize his whole problem of developing the sales steps as the forcing by compression of a broad and general concept of facts through a funnel which produces the specific and favorable consideration of one fact … The funnel has helped many salesmen to lead a customer from Attention to Interest, and beyond. Why are you relying on a century-old sales model in a post-internet world? The reliance on the sales funnel might have something to do with hard skills vs. soft skills. 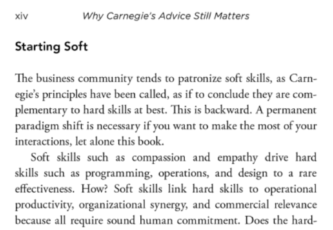 Soft skills include ones that are harder to quantify, like empathy, kindness, etc. Meanwhile, hard skills like aggressiveness, pushiness, and assertiveness are quantifiable (you SEE the results from using those hard skills – maybe because they make you as intimidating as an angry gorilla) – and that’s why bosses love them still. But, in the end, hard skills alone are bad for business. A study on failed CEOs revealed their businesses sank because they had only hard skills and no soft skills. Soft skills don’t gel with the sales funnel. But they do gel with a marketing lifecycle. It’s time for a new sales model, one that aligns with content marketing, soft skills, and real buyer journeys in the internet age. This is the basic lifecycle chart I came up with after brainstorming, researching, and collaborating with my team. The idea of a marketing lifecycle is not new, but it’s newer than the sales funnel. Ardath Albee, who has been a longtime pioneer in our industry, spoke about “lifecycle marketing” on the Marketo blog. Imagine, for example, your buyer is in the interest-and-intent stage and finds competitor content that more thoroughly addresses their information needs. The buyer loses interest in you but is still aware of your brand. Whoops – the buyer just jumped backward a step in your marketing lifecycle chart. Is that type of journey plottable on a sales funnel? No. 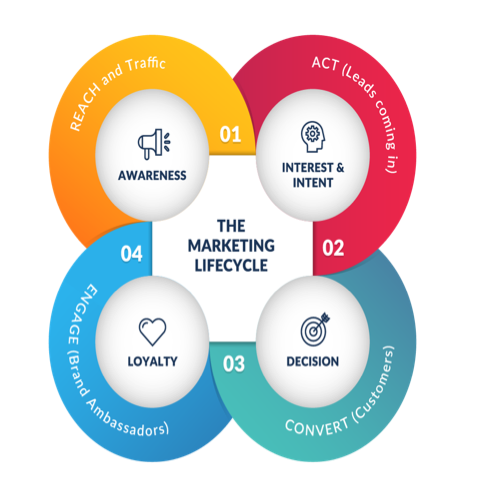 So, why a marketing lifecycle? HANDPICKED RELATED CONTENT: Are You Generating Demand or Just Identifying It? The talk in the marketing circles I’m in, from Mark Schaefer’s latest blogs about trust to LinkedIn conversations with executives and marketing teams, is about how slimy, cold sales tactics in marketing are falling by the wayside. That includes the overly aggressive sales funnel mentality. It runs directly opposite to the way buyers decide to buy online. In contrast, if you think of our buyers in terms of where they land in the marketing lifecycle, you give them room to be human. Rather than a rigid chart, the marketing lifecycle is more of a series of open pathways. The buyers can move from one stage to another fluidly as they often do in real life – sometimes even backtracking or skipping a stage altogether. Luckily, each fluid stage is mapped to the type of content that will win them back. Targeted content marketing will continue to nurture your leads all the way to loyalty and through your marketing lifecycle on a continuous loop. In B2B, the entire lead generation strategy centers on customized content interactions that build trust over a long and complex buying journey … In B2C, today’s digital marketing is about the content-driven customer experience – and how to develop content that earns the ability to be organically shared. A potential lead first hears about you. Your content here should be more value-focused, less promotional (leads are easily turned off by a sales pitch at this point). What type of content/activity will encourage customer action? 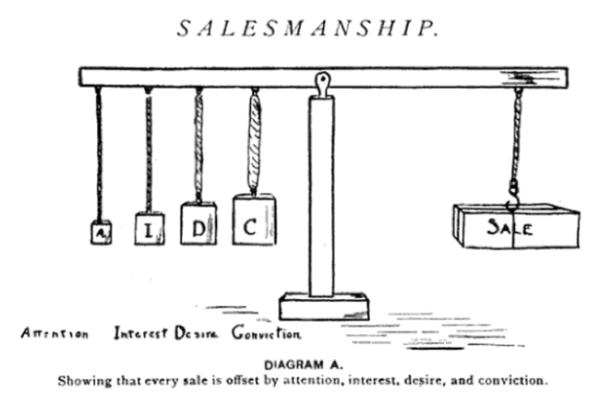 Interest and intent stand for two, usually separate, stages of the sales funnel (interest and desire). The problem with that: Smart online buyers can move from interest to desire in a heartbeat. Too many brands say goodbye to leads when all it takes is one moment for them to flip to wanting to purchase (or one well-timed coupon sent in an email). What propels this flip most often? Real-time human conversations, whether via live chat, a Skype call, or over the good ol’ phone. Once your leads are warm (thanks to your awareness-targeted content), getting them to have a conversation with your best salespeople is easier. And, those conversations have a ton of pull, especially if you sweeten things with a discount (with an expiration date attached). According to GeoMarketing, customers exchange more than 2 billion messages with businesses on Facebook every single month. Whatever platform you use, if you can engage with prospects one to one, you’ll have a better chance of moving them to want to purchase. The decision stage is the action stage. The desired action is, of course, the sale. If your targeted content has worked well at the other stages (filling information needs, answering questions, building authority, building trust), and your product/service is strong, this stage is where it all pays off. The loyalty stage doesn’t exist in the traditional sales funnel, but it’s incredibly important for longevity and profitability online. 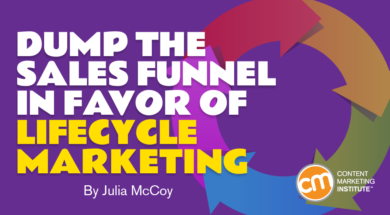 Instead of spitting out your customers after they purchase, lifecycle marketing keeps them in the loop. It’s about providing consistent value through content, touching base with them with conversational marketing, and maintaining that relationship you already built. This is how you earn loyal brand advocates. Which model would you rather have as part of your marketing strategy: (1) One that’s 120 years old and speaks to buyers making purchase decisions in person or (2) One that directly correlates to the online buyer’s journey, that aligns with the warmth of content marketing, and guides you on what to create to keep prospects in your circle? 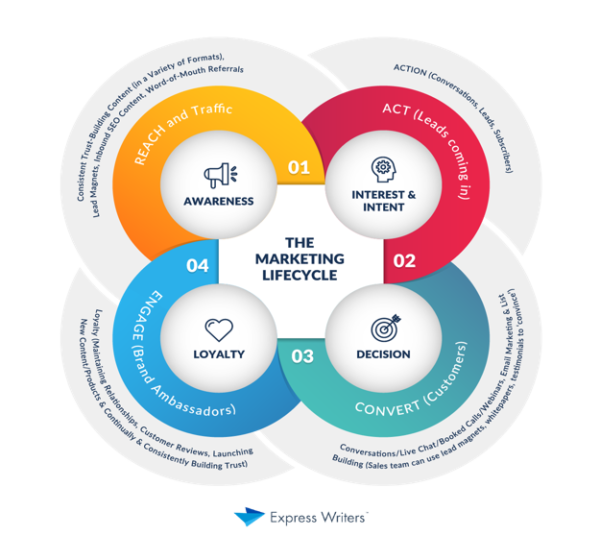 Lifecycle marketing is not easy, but it’s a better way to serve your customers who are looking for value and brands they can trust. Companies that provide quality content and service at each stage will rise above and beyond, and will ignite loyalty in their customers, who will become devoted fans and advocates. Whether it’s recognizing the shortcomings of the sales funnel or finding a better avenue for your content marketing to deliver what your audience needs, 2019 is a great opportunity to learn. Register today for Content Marketing World this September for the best available rates. Use code BLOG100 to save an additional $100.